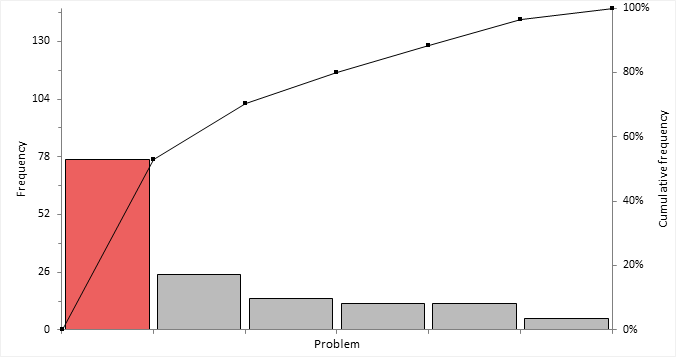 A Pareto chart shows the frequency of occurrences of quality-related problems to highlight those that need the most attention. Bars represent the individual values ordered by decreasing magnitude. A line represents the cumulative total. The left vertical axis is the frequency of occurrence or some other unit of measurement (such as cost or time). The right vertical axis is the cumulative frequency expressed as a percentage or total of the unit of measurement (such as total cost, total time). Note: In user-interface controls and documentation, it is typical to refer to the count/frequency for usability and clarity rather than more generic terms such as measure/unit of measurement.